This past Saturday I left the bike in the Dining Room Bike Shop, laced up my Montrails, and headed out to participate in the D.C. Rock and Roll Marathon. I like this 26.2-mile course because it stays within the District boundaries and traverses all of its four quadrants. In addition, it is a rolling course with a few actual hills along the way. The course is a double loop, which I did not like in the past because it makes it tempting to throw in the towel at 13.1 miles. I also have a love/hate relationship with the fact that the course passes my house at around 16 miles which, depending on my state of mind, can be a tempting time to end the run. Two years ago when I ran this course it was known as the National Marathon. It was a much smaller event then, which was one of the reasons it appealed to me. I was unprepared for the throngs of people running this year. I think now that it has become a Rock and Roll event it’s gone big time. Around 21,000 people registered for either the full or half-marathon distance, with 3,129 people completing the full marathon and 16,291 doing the half. Oh well. I’ll put up with the crowds. I still prefer a local run that does not require me to take a road trip or drive a car. Metro opened early for runners, and we were immediately treated to a train breakdown. Welcome to Washington! Fortunately, the delay only lasted 20 minutes or so, and the runners waiting with me all made it to the start in plenty of time. Participants were sent off in waves and it took about 25 minutes after the official clock started for my wave to cross the start line. Thank God for chip times, or whatever those things are called now. D-tags or something. For the first 13.1 miles, the race was shoulder to shoulder. I stuffed my headphones in my ears. Sometimes I feel that wearing headphones and listening to music detracts from the run experience, but with all the people and crazy energy around me I preferred to stay insulated from the crowded running madness. Since I am a middle-of-the-pack runner, I never long for company, whether I like it or not. For the first half of the marathon, I spent a lot of time enjoying my tunes, managing my speed, banking miles, and trying to find real estate to run. I didn’t talk to anyone except #bikeDC tweep @ebooksyearn, who was out spectating in the Northwest quadrant at the 8-mile mark or so. As I mentioned, the marathon course is a double loop and I was so excited to see all of the half marathoners peeling off toward the finish just before mile 13. Bye bye crowds! The runners thinned noticeably and I felt good about being out. The sun shone warmly and the spectators were out in full force. 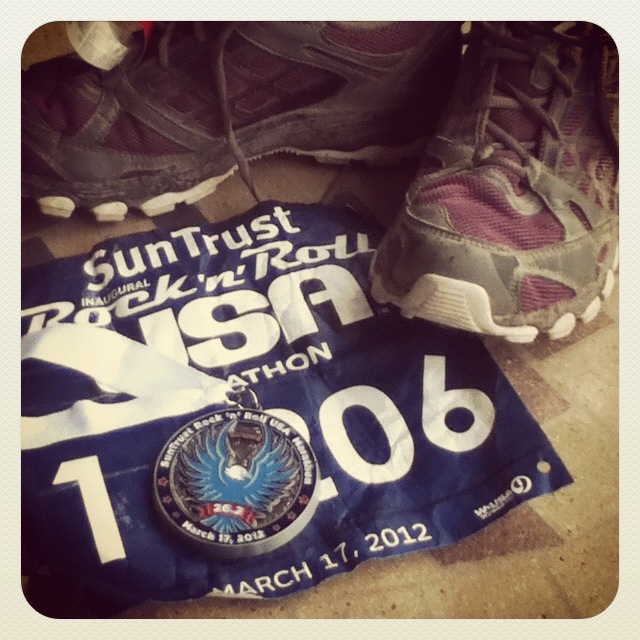 I have never run either a Rock and Roll Marathon or a run on St. Patrick’s Day and it really was a party. We started amid a wave of green interspersed with other colors. Many people dressed up, including spectators. I had several moments where I wondered who was more of a spectacle, the people running or the festive people outfitted in green and carrying posters who were out watching and supporting us. Because I had not trained sufficiently for this marathon (my longest long run was 12 miles. Yes, I’m serious! ), I left the camera at home and dedicated myself exclusively to completing the race. I did not need any distractions. Instead, I took a lot of great photos with my mind cam. One enthusiastic spectator waved a sign that read, “Run Like You Stole a Pot of Gold!” That was my favorite of the day. Another sign said, “Dig Deep,” and had drawn shovels on it. Still another noted that “Pain is Temporary, Pride is Forever.” I recalled those messages whenever I felt down, especially late in the run, when I suffered a side stitch and a low moment. The wall, I think some runners call it. The day went smoothly up until we passed my house. I was so worried that my legs would autopilot me back home, but they didn’t. I continued on the marathon course. Good job, legs. I told the group around me, “We just rode past my house.” Yes, I said rode. The runners gave me a pat on the back for not going home. After noodling around Fort McNair, we passed the Washington Nationals Stadium (miles 18 and 19) and then padded over the bridge to Anacostia to run the next few miles. This part of the route was pretty, as we spent a lot of time in a park area. However, it is also when my side stitch cropped up, and my mind reminded me about my lack of long run preparation and started yammering at me about all the other fun things I could be doing that did not involve running a marathon. Felkerino was off doing a 200K with the D.C. Randonneurs and I wondered if he might be having more fun than I was. My place slowed, then transitioned to a walk. At mile 22, I felt pretty down about my physical state. Then I pulled out my headphones, looked around, and felt the sun and breeze on my face. It was an awesome day to be outside and so special to be doing a marathon. I wasn’t hurting, just a little tired and depleted. The sweet feel of the sun and wind, and the fact that I had run 22 miles sank in, and my side stitch dissipated. I picked up my pace again, plugged back into my headphones, and prepped for the final hill up Minnesota Avenue. This street offers a long gradual climb at around mile 25 that makes a runner feel like the marathon finish is truly earned. With my side stitch gone, spirits lifted, and the finish so close, I felt like I zipped through the final miles. That wasn’t true, I was running 10:30 miles, but I felt good. The crowds encouraged us in and I finished in 4 hours, 40 minutes. It wasn’t a fast time (I’m not a fast runner), but I was happy with it. I finished injury-free and in good spirits. Up until the week before the marathon, I wasn’t sure I’d make it to the starting line and seriously considered riding a D.C. Randonneurs 200K brevet instead. After shelling out my ridiculous entry fee ($90 or so), though, I decided to dig in and try to earn the t-shirt and finisher’s medal. I’d been doing lots of cross-training including shorter runs, weight training, and other cardio so I felt I had the base fitness to do the run without too much discomfort. I don’t consider myself much of a runner, but I really enjoy mixing up cycling with other activities and events. I like the marathon distance because it takes less time than a 200K, but feels like one heck of a workout and it works my muscles and body in ways that are distinct to cycling (as my quads are currently reminding me). Also, despite the crowdedness of these events, it’s a rush to run 26.2 miles and have people cheer you on the whole way, especially when faced with a low moment. Someone’s smile, clapping, and words of encouragement– You can do it! Looking good runners! You’ve got this!– can provide a much-needed energy boost. That’s an awesome feeling. Yeah, that’s a good argument for not having halves and full marathons on the same course. This makes me miss running and wonder if I should try learning foot forward running to see if that would let me run again. I love biking and the way it let’s me incorporate exercise into my everyday routine, but it doesn’t give me the same feeling that running does. Sounds like great day for a run. Totally agree with you! I’ve consistently been able to get into a deeper meditative state when running. I love your sunny disposition! Congrats on earning that medal despite being undertrained. Running a marathon yet “not much of a runner” eh? Mm hmm. I see an ultra in your future. Thanks, and my hopes are high for a future ultra!! Congratulations! Cycling definitely works different muscles than running, as I find out each fall when I attempt to prepare for the Army 10-Miler. I’m very happy that you decided to stick to your goal, although I would very much have enjoyed meeting you at the brevet! Likewise! Maybe sometime soon we’ll actually meet in a space that is not the internet, ha! Congratulations. I once ran the Shamrock Classic 5-miler in Boston. It was so cold the runners’ drinking water were spilling it on the street and a sheet of ice formed. Runners were sliding and slipping all over the place. There used to be (for a couple of years) a DC Marathon. I ran it. The long run from Anacostia to the Capitol is forever etched in the pain receptors of my mind. Congratulations! I love that you mix up different sporting events. Always cool to see people I know run past my house. This year was definitely the most partying atmosphere for the marathon. Our neighbors always hand out beer, which helps, but this year was especially festive. I’m not sure if it was the Rock and Roll or St Patrick’s Day that did it. I suspect the latter. Yes, it was 26.2 miles of festive!! Great to see you, by the way. Nice work. Great perspective of prevailing determination to look at the upbeat. and great reminder that my trek to the starting line for the MCM isn’t a bad thing – no passing my house! I still think our 200 was a lot easier! Pingback: Running Away from Sandy: 2012 Marine Corps Marathon | chasing mailboxes d.c.